The tenth A1G locomotive, it left Rivarossi as the sole supplier for the last three. 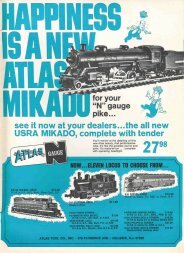 At this point in time, no other N scale manufacturer or importer could touch Atlas when it came to different locos offered simultaneously although, in 1969, the output from all N scale suppliers was probably at the first peak. There was tremendous growth in 1968 - 69 and Atlas had four American prototype based steamers on the market at the same time; something not seen today from any manufacturer except maybe Con-Cor. 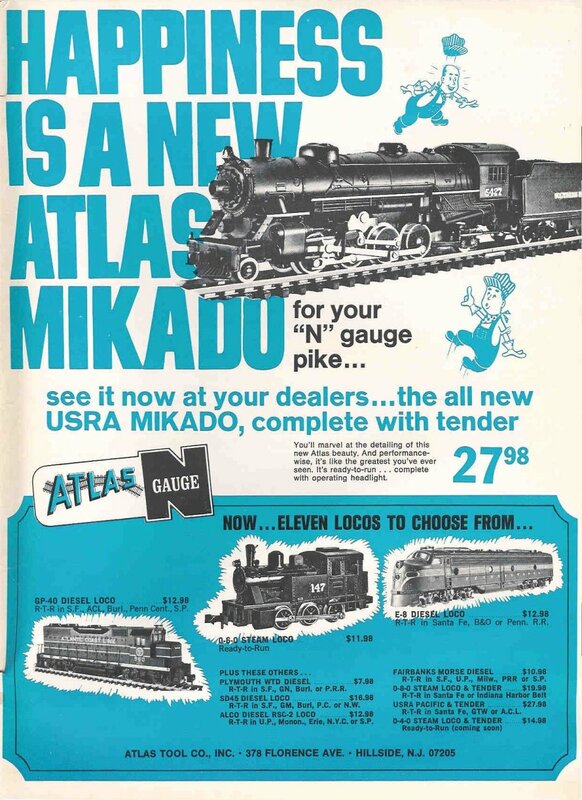 The Mikado is one of two A1G locomotives that were sold as undecorated (the 0-4-0 being the other) and furnished with a set of decals for various railroads to be applied by the hobbyist. That seemingly inexpensive price (in today's world) of $27.98 was actually the equivalent of about $110.00 nowadays. The prototype of this model was another of the USRA designed locomotives during World War I. It was by far the most popular design of all the USRA engines with 625 of the light version being built (as with the Pacific, there was a heavy version too). The first USRA light Mikado was built for the B&O in July of 1918 and eventually about 50 railroads had them in their rosters. The design was so popular that there ended up being over 5,000 copies built. Wow! Speaking of wow, the Mikado locomotive in general in the United States had become the standard freight locomotive by 1920 and there were, in time, about 14,000 total built! Incredible! So, I guess we could conclude that this particular locomotive was a wonderful choice for Atlas to have offered. The construction of the Mikado generally follows that of the Pacific but there are differences. The shell, at first glance, looks to be the same as the Pacific shell but, if you look closely, you will see the same differences between the two as on the prototypes. Although the boiler outline is nearly identical, there is a slight difference in the slope and length of the second course behind the smokebox; hence the sandbox is a scale foot or so farther back on the Mikado. There are also piping differences and the walkways are straight from the front of the cab to the smokebox instead of being stepped up as on the Pacific (larger drivers on the Pacific). Mechanically, the two are very similar but, again, there are some differences. Although the same motor and couplings are used, the Pacific uses two same-sized gears and retainers between the drivers, the rear of which serves as the worm gear. The Mikado, to accomodate four drivers, uses progressively smaller idler gears going forward and three different sized retainers. On the Pacific, the valve hanger and crosshead guide assemblies are held to the frame with the screw that also retains the headlight bulb ground contact. On the Mikado, the assemblies are riveted to each side of the frame. While the Pacific uses a separate screw and coil spring to retain the pilot truck, the Mikado uses the same screw used for the headlight bulb ground contact. The coil spring used serves to both put downward pressure on the truck and upward pressure on a washer that is used for the bulb ground contact. Ingenious designs, really. The same cylinders/pilot assembly, headlight bulb, hot headlight bulb contact, and trailing truck are used on both models. The tenders are also identical. The side rods are attached to the first and third drivers only with the connection to the first set being a slot as on the 0-8-0s and Pacifics. Atlas Identification: Locomotive: "ATLAS ITALY" molded into the underside of the pilot attached to the frame. There is no Atlas logo in the shell, just the part number 10502 (hmmm...same number as on the Pacific shell) molded into the underside of the right side of the cab roof. Tender: "ATLAS" (in the "graduated" logo) molded into the underside of the tender floor on the left front side. "MADE IN ITALY by RR" molded across the underside of the tender floor at the rear. "ATLAS" (in the "graduated" logo) molded into the right rear underside of the tender shell. The number 10340 molded into the center rear underside of the tender shell. "MADE IN ITALY by RR" molded into the left rear underside of the tender shell.These locomotives were sold by other importers after Atlas so, again, you have to look for the Atlas identifiers to be sure you have an Atlas version. Variations: The only variation that I am aware of is the one mentioned in the Greenberg guide. There is an "A" version which is all black and a "B" version which has white stripes on the walkway edges and tender sill.